Mark’s guiding principle is to bring back into the spotlight some of the talented and highly-trained artists so often overshadowed by their more fashionable contemporaries by offering their paintings for sale. Many of them now appear infrequently on the art market, although their work is striking and beautiful, and research reveals how esteemed they once were. 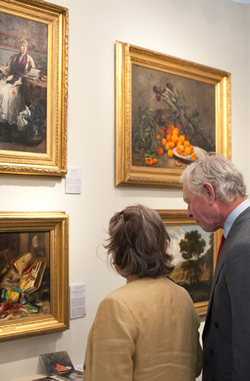 Artists in the collection range chronologically from the 17th century to the 21st. A contemporary example is Stephen Rose (b. 1960), who produces still life paintings, landscapes, nudes and portrait paintings. Like Stephen, nearly all of the artists included that have European paintings for sale were trained in the major art schools (the Slade, the Byam Shaw School of Art, the Royal Academy Schools, the Munich Academy, the Dublin School of Art, the British School in Rome, the Danish Royal Academy), exhibited in the main institutions and are represented by works in public collections worldwide. William Gowe Ferguson, for example – 17th century painter of ‘gamepieces’ – has pictures in the Louvre, the Tate, the Musée des Arts décoratifs de Bordeaux and the Manchester City Art Gallery. The landscape painters Joseph Henderson and Frederick R. Lee both exhibited over a long period in the Royal Academy (Lee for 46 years); whilst Henderson showed in the Royal Scottish Academy for fifteen years from the age of 25, and in the Royal Institute of Painters in Water Colour. Edward Wesson, self-taught landscape and marine painter, exhibited in five different Royal societies during much of his career. By offering this selection of European paintings for sale, Mark aims to highlight the skill, quality and beauty of these forgotten works. Albert Ludovici served on the committee of the Society of British Artists when Whistler was President (ditto the International Society), as well as many other contemporary galleries; whilst Bertram Nicholls’s work can be found in major institutions all over Britain, and across the globe from Canada to Australia. The selection of European ­paintings for sale are all created by extremely skilful and versatile artists, who have failed to gain a lasting grip on public attention – perhaps through the competitiveness of the art market, through a lack of vision in their past dealers, or through too little public exposure. So you can find them here – talented painters from the last four-&-a-half centuries, creating beautiful and decorative works of art for any interior, and mostly quite rare as they are not often for sale.